The Scirocco Apartments are situated right in the heart of the caldera on the cliff in the traditional area at Fira the main village, in a unique spot with a magnificent full panoramic view of the caldera. From here you can overlook from above the sea, the volcano, neighboring Islands, the Old Port with its famous "donkey steps" and the cable car.It is one of the most fascinating views in the world! The complex provides a small reception / breakfast terrace and a swimming pool, out in the open with a full panoramic view . Experience from the Scirocco terraces the most breathtaking sunset. The cave houses are very spacious, they are build inside the rock with loft & round ceilings, 2 of them are one the same level, perfect for a community holiday. 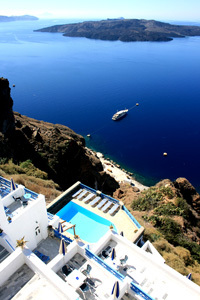 Scirocco is situated in the heart of the traditional Caldera on the cliffs at Fira, the main village of the island. For 2-5 pers., with 1.5 - 2 rooms, shower/ wc, air-conditioning, fridge, in order to prepare a snack a few dishes, kettle etc are provided, phone, own balcony at the caldera. Some of them provide a kitchenette. For 2-5 pers., spacious units, some of them provide a loft and kitchenette, build inside the rock, loft, round ceilings, 2 of them are on the same level, very good for a community holiday, air-conditioning, phone, shower/wc, own balcony at the caldera. For 2-3 pers., one room, shower/wc, air-conditioning, fridge, in order to prepare a snack a few dishes, kettle etc are provided, phone, own balcony at the caldera. From this excellent spot on the cliff in the middle of the traditional caldera area it is only ca 3 min. on foot taking some steps to get to the centre of the main village where you will find all local amenities, such as the main bus stop, good bus connections to all beaches & villages, main taxi rank, banks, shops, supermarkets, post office, tourist offices, car and motorbike rentals, pharmacies, restaurants and nightlife. - Rates are in Euro per night and per unit for 2 person and include daily room service & taxes. - Breakfast is available for an extra cost. - Additional person per room/night 40-50 euro. Use the Web Form to make a RESERVATION OR TO CONTACT US for more information. All bookings & requests are received, answered and confirmed by the hotelier.